3:30 AM … he looks at the clock again. Each minute feels like an hour, each turning of the hour an eternity. Enough of this, he thinks and jumps out of bed, looks out the window into the waning darkness, checking for lights at his buddy’s house, then pours his first black coffee of the day. None of the fishermen in St. Jacques are sleeping well this morning. Today, their lobster pots go in the water! When the season opens fishermen methodically place their pots in favourite locations, some of which they may have used for years. Once the pots are set there is a required waiting period of forty-eight hours before they can be hauled. The excitement and anticipation of first catch makes this the longest forty-eight hours of the year. Everyone keeps an eye on the sky, the ocean, the moon, tides and an ear to the weather forecast. Wind is a concern for these Newfoundland lobster fishermen who typically work from relatively small open boats. It also affects catch rates. A wind storm can see pots left in the water for several days and that’s not good for the fishers or the lobsters. A pot that runs out of bait stops fishing; lobsters facing tumultuous water seem not to be on the move as much. A severe storm can result in loss of fishing gear. License limitations on the number of pots allowed make every one precious. Winds at the start of this year’s season were forecast to be gusting to 60 km. On the north side of Fortune Bay a northerly wind is fair when close to shore; however, it can be a difficult wind to deal with once you are outside the shelter of harbours like St. Jacques. If you are fishing on the southern side of the bay it’s near impossible. And what about the moon? More lobsters are caught just before a full moon and tend to decrease as the moon wanes. Research in Australia shows this can increase by ten percent and decrease by five percent with the change of the moon. They think it has to do with more food sources being exposed during the higher tides of the full moon prompting more lobsters to be on the move. 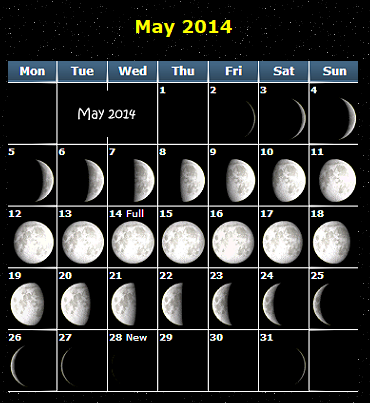 Below is a chart showing the phases of the moon for May, 2014. Check out sea conditions in the St. Jacques/Belleoram area by clicking on tide-forecast. Check out the information broadcast from the weather station located on Sagona Island in Fortune Bay to see what weather conditions are like in St. Jacques on any given day. Lobster Fishing Area 11 consists of Fortune Bay extending along the south coast of Newfoundland to a point about 15 miles west of Burgeo. In the days leading up to the opening of the season everyone wants to know what will be the opening price for Newfoundland Lobster. The market dynamics around lobster pricing is complex and subject to may variables; however, one indicator which provides a picture of what might be, are the prices in neighbouring provinces of Nova Scotia, PEI and New Brunswick. The Fish, Food and Allied Workers Union tracks the prices in those provinces. Lobster catches have been good in recent years. This can be attributed to several factors. The number of fishermen has decreased as a result of a government license buy-out program; the total number of pots per license holder has been reduced; and probably most important, the voluntary V-notching of spawning female lobsters as a conservation measure. The men and women who work in the lobster boats from now until late June are neither Johnny-come-latelies nor dilettantes. They turn their faces to the sub-zero winds that blow in off the North Atlantic, sink their hands into the icy waters of Fortune Bay and have half a day’s work completed by the time most of the rest of us begin our day. At the beginning of the season pots are set in deeper water then moved closer to shore in more shallow water as the season wears on. Early in the season a ten-hour trip is not uncommon; later, that can be reduced to six hours each day. Early in the morning the sound of outboard motors inform the community that the boats are going out. Tom and Ros, Neil and Marlene, Levi and Tanya, Keith and George, and Edgar and Shayne are much wider awake than the rest of us as they set out for their daily work on the ocean. Lobster fishing practices have changed over the years. Pots are no longer hauled using the back-breaking hand-over-hand style. Fishermen now use a mechanized pot hauler. The traditional wooden pots that men so carefully crafted throughout the winter months for generations are being replaced by wire mesh structures which require far less maintenance and deliver bigger catches. Soon, broken lobster pots washed up on the beach will be gone from our sight. 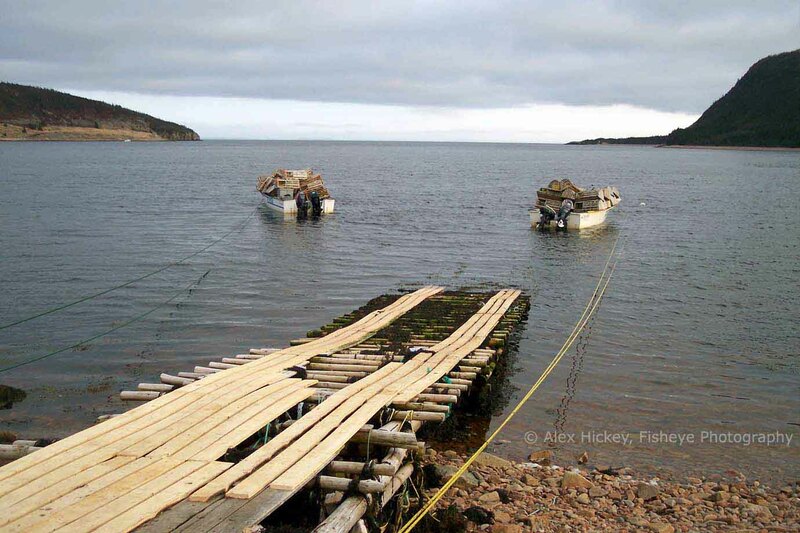 Take a look at a video profile of the Newfoundland Lobster Fishery produced by the Newfoundland Fish Food and Allied Workers Union. Curt Brown of the Gulf of Maine Research Institute filmed a lobster trap going into the water and fishing. In this video you can see the bait bag and a lobster feeding on the bait.